From producer Jerry Bruckheimer and director Gore Verbinski, the filmmaking duo behind the blockbusting Pirates of the Caribbean franchise, comes Disney/Jerry Bruckheimer Films’ The Lone Ranger (2013), a thrilling adventure infused with action and humour, in which the famed masked hero is brought to life through new eyes. To celebrate the 9 August UK release of The Lone Ranger, we’re giving you and a guest the chance to see the film in London a month before everyone else (on 10 July) with FIVE pairs of tickets up for grabs. This is an exclusive competition for our Facebook and Twitter fans, so if you haven’t already, ‘Like’ us at facebook.com/CineVueUK or follow us @CineVue before answering the question below. 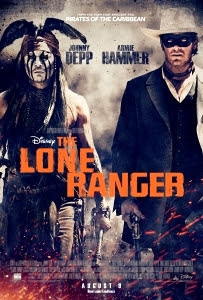 In this new version of The Lone Ranger, Native American warrior Tonto (Johnny Depp) recounts the untold tales that transformed John Reid (Armie Hammer), a man of the law, into a legend of justice – taking the audience on a runaway train of epic surprises and humorous friction as the two unlikely heroes must learn to work together and fight against greed and corruption. If you win you’ll need to be available in London’s West End from 6:00pm on the evening of 10 July (prize does not include travel or accommodation). What is the name of The Lone Ranger’s beloved horse? Gore Verbinski’s The Lone Ranger is released in UK cinemas on 9 August. Check out the trailer on YouTube here. The competition closes at midday on Thursday 4 July, 2013.